“Lansing” redirects here. For other uses, see Lansing (disambiguation). Nickname(s): Capital City, L-Town, "The Heart of Michigan"
The first recorded person of European descent to spot the area that is now Lansing was explorer Hugh Heward in 1790 while canoeing the Grand River. The land that was to become Lansing was surveyed as "Township 4 North Range 2 West" in February 1827 in what was then dense forest. It was the last of the county's townships to be surveyed, and the land not offered for sale until October 1830. There would be no roads to this area for decades to come. The settlement of fewer than 20 people would remain dormant until the winter of 1847 when the state constitution required that the capital be moved from Detroit to a more central and safer location in the interior of the state; many were concerned about Detroit's proximity to British-controlled Canada, which had captured Detroit in the War of 1812. The United States had recaptured the city in 1813, but these events led to the dire need to have the center of government relocated away from hostile British territory. In addition, there was also concern with Detroit's strong influence over Michigan politics, being the largest city in the state as well as the capital city. "Lower Village/Town", where present-day Old Town stands, was the oldest of the three villages. It was home to the first house built in Lansing in 1843 by pioneer James Seymour and his family. Lower Town began to develop in 1847 with the completion of the Franklin Avenue (now Grand River Avenue) covered bridge over the Grand River. "Upper Village/Town", where present-day REO Town stands at the confluence of the Grand River and the Red Cedar River. It began to take off in 1847 when the Main Street Bridge was constructed over the Grand River. This village's focal point was the Benton House, a 4-story hotel which opened in 1848. It was the first brick building in Lansing and was later razed in 1900. "Middle Village/Town", where downtown Lansing now stands, was the last of the three villages to develop in 1848 with the completion of the Michigan Avenue bridge across the Grand River and the completion of the temporary capitol building which sat where Cooley Law School stands today on Capitol Avenue in between Allegan and Washtenaw Streets, and finally the relocation of the post office to the village in 1851. This area would grow to become larger than the other two villages up and down river. For a brief time the combined villages were referred to as "Michigan" but was officially named Lansing in 1848. 1825 – Lansing Township surveyed. 1836 – A pair of New York speculators plot and market a non-existent city known as "Biddle City." The New Yorkers that bought into the idea arrive in Lansing to discover that the plots they had bought are located in a marsh, and are underwater. Some of the pioneers stay, but develop a village in what is now Old Town Lansing a mile north of the non-existent "Biddle City." 1847 – The state capital moved from Detroit to Lansing Township. 1855 – Michigan State University is founded as the Agricultural College of the State of Michigan. 1859 – The city of Lansing officially incorporated with about 3,000 citizens inside of 7.5 square miles (19 km2). 1879 – New State Capitol dedicated. The structure cost $1,510,130. 1881 – Michigan Millers Insurance Company founded. 1897 – Ransom E. Olds drives his first car down a Lansing street. Later that year he founded the Olds Motor Vehicle Company, which became the Oldsmobile division of General Motors in 1908, and he was also the founder of the REO Motor Car Company in 1904, both headquartered in Lansing. 1904 – The "most extensive flood in 135 years of local history" causes the Grand River to overflow its banks on March 24–27, leading to major damage and one death. Bridges at Logan Street, Kalamazoo Street, Cedar Street and Mt. Hope Road are all washed away. The Kalamazoo St. bridge lodges against the Michigan Avenue bridge; it is later salvaged and re-erected at Kalamazoo Street. 1910 – The population of the city nearly doubles from the 1900 census to 31,229. 1912 – The Accident Fund Insurance Company of America founded. 1916 – Auto-Owners Insurance Company founded. 1929 – The Lansing Symphony Orchestra founded. 1940 – Lansing's population stagnates, only rising by 356 over the decade to 78,753. 1954 – Frandor Mall opens – first in the area, and second in the state. 1956 – The city reaches 15 square miles (39 km2) in size. 1957 – Lansing Community College founded. 1960 – The city's population finally breaks the 100,000 mark at 107,807. 1961 – Jackson National Life Insurance Company founded. 1965 – The city reaches 33.3 square miles (86.2 km2) in size. 1970 – Lansing reaches its peak population of 131,546. 1972 – The Thomas M. Cooley Law School founded. 1980 – Lansing's population declines for the first time losing 989 to hit 130,414. 1989 – The Library of Michigan and Historical Center near the Capitol Complex dedicated. 1992 – The Michigan State Capitol completes an extensive renovation to restore it to its original grandeur. 1998 – Mayor David Hollister signs a 425 Agreement with Alaiedon Township in September to facilitate the development of the headquarters of Jackson National Life Insurance Company. 1999 – Mayor David Hollister signs a 425 Agreement with Meridian Township in November to facilitate the development of the Governor's Collection/College Fields upscale housing development and golf course. 2000 – Lansing's population experiences its greatest drop in its history, falling over 6% over the preceding decade to 119,128. 2001 – GM opens new assembly plant, Lansing Grand River Assembly. Builds the Cadillac CTS, STS, SRX and V-Series. The architecture of the assembly plant resembles a high-tech research facility instead of a traditional factory. 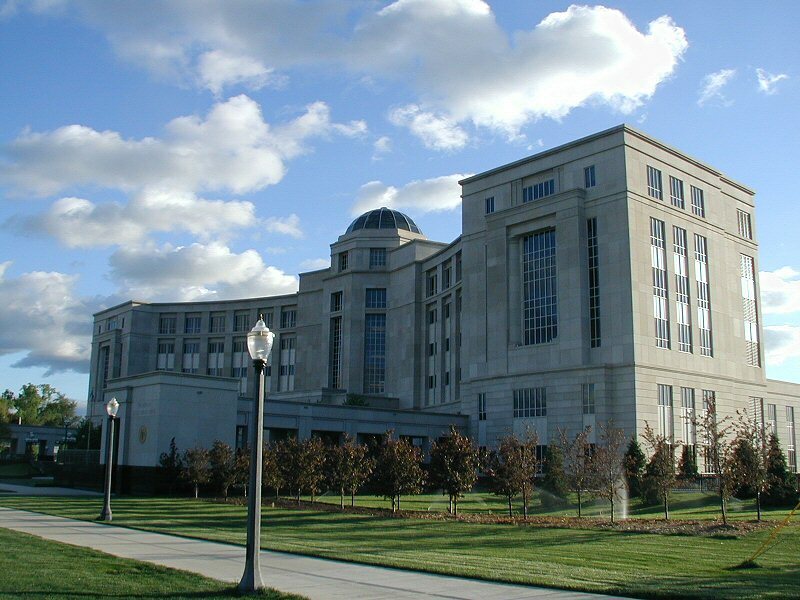 2002 – The Hall of Justice (Michigan Supreme Court building) at the West-end of the Capitol Complex is dedicated. 2004 – Last Oldsmobile rolls off the assembly line at Lansing Car Assembly on April 29. This same year the Thomas M. Cooley Law School becomes the largest law school in the nation. 2005 – Mayor Tony Benavides signs a series of three 425 Agreements with Delta Township and General Motors facilitating the development General Motors' Lansing Delta Township Assembly Plant. 2006 – GM opens state-of-the-art facility in nearby Delta Charter Township. As with the 2001 assembly plant built in Lansing, the Delta plant resembles a high-tech research facility and not a traditional factory. 2008 – Accident Fund Insurance Company of America announces the renovation of the Ottawa Street Power Station and addition of modern buildings connected by an atrium for their new headquarters. 2009 – Construction begins on the new Lansing City Market along the Grand River and the river trail in downtown Lansing. 2009 – Auto-Owners Insurance Co. announces it will invest $105.3 million into expanding its Lansing headquarters and adding 800 new jobs. 2010 – The Eyde Development Company announced they will be spending $22–$24 million to renovate the landmark Knapp's Building in downtown Lansing. 2010 – Kiplinger names Lansing one of the "10 Great Cities for Young Adults." The North Lansing dam of the Grand River. The Lansing River Trail and Ottawa Street Power Station are visible behind. According to the United States Census Bureau, the city has a total area of 36.68 square miles (95.00 km2), of which, 36.05 square miles (93.37 km2) is land and 0.63 square miles (1.63 km2) is water. This figure includes two 425 Agreements with Alaiedon Township and Meridian Township, and the four 425 Agreements with Delta Township since 2000. Lansing has a typically Midwestern humid continental climate (Köppen Dfb/Dfa) that is influenced by the Great Lakes. Winters are cold with moderate to heavy snowfall, while summers are very warm and humid. The monthly daily average temperature in July is 71.5 °F (21.9 °C), while the same figure for January is 23.4 °F (−4.8 °C); the annual mean is 48.21 °F (9.01 °C). On average, temperatures exceed 90 °F (32.2 °C) on 8.8 days of the year and drop below 0 °F (−17.8 °C) on 10−11 nights. Precipitation is generally greatest during summer but still frequent and significant in winter. Snowfall, which normally occurs from November to April, averages 49 inches (124 cm) per season. The highest recorded temperature was 103 °F (39 °C) on July 6, 2012, and the lowest recorded temperature was −37 °F (−38 °C) on February 2, 1868. The middle of the Southside—South-Central Lansing—contains the Old Everett Area. This location once contained the Everett School District and was annexed into the city in 1948. As of the census of 2010, there were 114,297 people, 48,450 households, and 26,234 families residing in the city. The population density was 3,174.9 per square mile (1,226.3/km2). There were 54,181 housing units at an average density of 1,505.0 per square mile (581.3/km2). The racial makeup of the city was 61.2% White, 23.7% African American, 0.8% Native American, 3.7% Asian, 0.04% Pacific Islander, 4.3% from other races, and 6.2% from two or more races. Hispanic or Latino of any race were 12.5% of the population. Non-Hispanic Whites were 55.5% of the population in 2010, compared to 86.4% in 1970. Foreign-born residents made up 8.3% of the population. The median age in the city was 32.2 years. 24.2% of residents were under the age of 18; 12.3% were between the ages of 18 and 24; 30.2% were from 25 to 44; 23.8% were from 45 to 64; and 9.7% were 65 years of age or older. The gender makeup of the city was 48.4% male and 51.6% female. The Brookings Institution has ranked Greater Lansing among the top 10 "medium-sized metropolitan areas" in the United States for refugee resettlement, with 5,369 refugees resettled from 1983–2004. St. Vincent Catholic Charities and Lutheran Social Services handle the adult and unaccompanied minor resettlement processes, respectively, while other organizations, such as the Refugee Development Center, focus on providing educational and social support services to refugees in the Lansing area. Nearby Michigan State University provides a source of volunteers for many of these programs. The city largely supports the Democratic Party. It has not had a Republican mayor in office for more than a decade, and the last two mayoral elections have hosted only Democratic candidates. At the state level, Lansing is located in the 23rd district of the Michigan Senate, which has been represented by Democratic state senator Gretchen Whitmer since January 1, 2007. The small portion of the city that extends into Eaton County is located in the 24th district of the Michigan Senate, which is currently represented by Republican state senator Rick Jones. The city lies in the 67th, 68th, and 71st districts of the Michigan State House of Representatives, represented by state representatives Tom Cochran (D-67), Andy Schor (D-68), and Theresa Abed (D-71). Though Lansing is not a designated county seat, some county offices are located in downtown Lansing, including a branch office of the county clerk, the county personnel office, and some courtrooms. The Otto E. Eckert power plant along the Grand River, operated by the Lansing Board of Water and Light. Several urban renewal projects by private developers are adding higher end apartments and condominiums to the Lansing market. The Arbaugh, a former department store across from Cooley Law School, was converted into apartments in 2005. Motor Wheel Lofts, a former industrial site, was converted into loft-style living spaces in mid-2006. A combination retail and residential complex immediately south of Cooley Law School Stadium (formerly Oldsmobile Park) called "The Stadium District", was completed in 2007. The Stadium District, was redeveloped using a grant from the Cool Cities Initiative. In May 2006 the historically significant Mutual Building located on Capitol Avenue was purchased by The Christman Company to be renovated back to its original grandeur and used as the company's headquarters. Additional downtown developments include the renovation of the historic Hollister Building, and the expansion of the former Abrams Aerial Building. As of August 2008, an 18-story condominium high-rise called Capitol Club Tower is in the design phase with the adjacent parking structure already having been approved by city council and purchased by the developer. The city market, in existence since 1909, was approved to be sold for a multi-building mixed-use development called MarketPlace, right next to the current market on the adjacent riverfront. The MarketPlace project was redeveloped along with BallPark North, another mixed-use development that will be immediately north of Oldsmobile Stadium. The new city market is just north of the Lansing Center, across the river from where the Accident Fund Insurance Company renovated the former (art deco) Ottawa Street Powerplant into their new headquarters. In addition to the renovation, Accident Fund Insurance Company built a modern addition to the north of the historic portion that is connected by an atrium for more office space, as well as a parking structure. In 2009, the restaurant Troppo began construction on a new 2-story building that will have an open air patio on the roof facing the Capitol building. Developer Eyde Co. announced plans on April 6, 2010, to renovate the historical and prominent Knapp's building in downtown Lansing for first floor retail, office space and apartments/condos on the top floor (5th) in a $22–24 million project. Each year in June, the Michigan Pride festival includes a gay pride parade from Riverfront Park to the capitol. The Capital City African American Cultural Association hosts an African American Parade and Heritage Festival every year for over a decade. The chair of the CCAACA is the Rev. Dr. Michael C. Murphy, who was pastor of St. Stephen's Community Church and is currently the pastor of Peoples Congregational, United Church of Christ, Washington D.C. He is a former State Representative for the 68th House District in Michigan, former President of the Lansing City Council, and a long-time community leader. The parade highlights African American culture, its influence in Michigan, and recognizes prominent African American individuals in the community and their contributions to Lansing as the grand marshal of each parade. The festival immediately following the parade consists of live entertainment, soul food and lots of fun for adults and children. It is held every year on the first Saturday in August and begins at 11:00 a.m. in downtown Lansing, Michigan. The festival is held at Ferris Park in downtown Lansing. In 2009 they celebrated 10 years. The 24th Annual Silver Bells in the City Parade proceeded through the streets of downtown Lansing on November 21, 2008. The 2007 parade attracted over 120,000 for the Electric Light Parade followed by the lighting of Michigan's official Christmas tree in front of the State Capitol and a firework show (weather permitting) over the State Capitol. The Lansing Symphony Orchestra has been entertaining generations of Lansing area residents since 1929. The current music director is Timothy Muffett. There are many bars and clubs in downtown Lansing and the surrounding neighborhoods. Bars and clubs in downtown include: Macs Bar, The Loft, Brannigan Brothers, Kelly's, The Firm, Tavern on the Square, 621, Excel, The Exchange, Harem's, Rum Runners (dueling piano bar), Moriarty's, Nuthouse, Art's and The Green Door to name just a few. Many of these bars and clubs have live bands; The Green Door is a blues bar that has live bands 7-nights a week. The Lansing JazzFest and the Old Town BluesFest host leading musicians, and are two of the larger music festivals held each year in the state. Old Town's Festival of the Moon and Sun is a two-day festival full of food and live music. Old Town Oktoberfest is a two-day event drawing hundreds to the Old Town neighborhood for live polka music, authentic German food and of course world renowned German-style beer. It was announced in May 2007 that the city would host a Thursday night, summertime blues concerts along Washington Square in downtown Lansing named "Blues on the Square" that will feature national acts during the summer June–August. In 2008 the event regularly drew crowds over 500 to downtown. The Common Ground Festival is a musical event held over a week every July at the Adado Riverfront Park in downtown Lansing pulling in crowds over 90,000 for the week. It began in 2000 and replaced the Michigan Festival that was held in nearby East Lansing. It has wide range of musical acts. In 2008 acts included Staind, Drowning Pool, Sammy Hagar, The Hard Lessons, Snoop Dogg, REO Speedwagon, Kellie Pickler, Seether and Trace Adkins. Every year the City Pulse names the top original Act in the Top of the Town Awards. The 2010 winner was Eastside neighborhood native indie rock band Loune. The 2011 winner was pop punk act Frank and Earnest. The Riverwalk Theatre, (formerly the Okemos Barn Theatre), the Lansing Civic Players, and the now defunct BoarsHead Theater are or were all located in downtown. Peppermint Creek Theatre Company is a well established "new" award winning theater company. Happendance,  Michigan's longest-running professional modern dance company, has been based in Greater Lansing since 1976. The Greater Lansing Ballet Company is an award-winning ballet and dance company. The Creole Gallery brings in various musicians and hosts the Icarus Falling Theater group. The Impression 5 Science Center, a children's science center located in a historic wagon works factory on the Grand River. The Michigan Museum of Surveying, the only museum in North America solely dedicated to surveying and mapping. It is located in a former steam plant constructed in 1923. The R.E. Olds Transportation Museum, a museum dedicated to the education of Lansing's role in the development of transportation, particularly the automobile. The Michigan Women's Hall of Fame, a museum dedicated to the historical accomplishments and achievements of Michigan women. The house is located directly south of downtown in the 1903-built Cooley-Haze House. The museum is surrounded by Cooley Gardens. The Turner-Dodge House, a museum dedicated to Lansing's early pioneers. The museum sits in the Classical Revival-styled Turner-Dodge Mansion, built in 1858 for James and Marion Turner, and later by their daughter and her husband. It is on the National Register of Historic Places. The Michigan Library and Historical Center contains one of the 10 largest genealogy collections in the nation, has a museum dedicated to Michigan's history among other attractions. The Lansing Time Capsule, also known as the Lansing 150 Time Capsule Project, is currently in progress in Lansing as part of the Lansing 150 Sesquicentennial celebration marking the city's 150th birthday. The capsule will be enclosed within an art sculpture in downtown Lansing, to be opened in 2159 in the city's 300th year. The Lansing Time Capsule Committee convened in autumn of 2009 to set the list of objects to be included in the time capsule. A film documenting the process, Encapsulating Time, was created by graduate students in the American Studies Program at Michigan State University. The film itself and a companion text will be included among the Time Capsule's objects. For more information about Encapsulating Time refer to the film wiki. In October 2009 the Wharton Center for Performing Arts completed a 24,000 square feet (2,230 m2), $18.5 million expansion and renovation, having already spent over $1.3 million in 2008. Many Broadway shows come to The Wharton Center before traveling to theaters in larger places such as Chicago. The Kresge Art Museum, the MSU Museum, and the Abrams Planetarium are highly acclaimed cultural destinations located on the campus of Michigan State University in East Lansing. In June 2007 MSU announced the plans to build a new art museum after a $26 million gift from Eli and Edythe Broad. Internationally known Pritzker Prize winning architect Zaha Hadid of London won the design competition for the East Lansing museum that was completed in November 2012. 88.1 WLGH – (Leroy Township, contemporary Christian) "Smile FM"
88.5 WJOM – (Eagle, contemporary Christian) "Smile FM"
88.9 WDBM – (East Lansing, college/Michigan State University) "The Impact"
92.1 WQTX – (St. Johns, country) "Big Country"
93.7 WBCT-FM – (Grand Rapids, country) "B93"
94.1 WVIC – (Jackson, modern rock) "94.1 the Edge"
96.5 WQHH – (DeWitt, urban) "Power 96.5"
97.5 WJIM – (CHR) "97-5 Now-FM"
99.9 W260BX - (religious/southern gospel) "Family Life Radio"
100.7 WITL-FM – (country) "Whittle"
101.7 WHZZ – (adult hits) "Mike-FM"
105.7 WOOD – (Grand Rapids, adult contemporary) "Star 105.7"
106.1 WJXQ – (Charlotte, active rock) "Q106"
730 AM WVFN – (East Lansing, sports talk) "The Game"
1110 AM WUNN – (Mason, religious/southern gospel) "Family Life Radio"
1180 AM WXLA – Dimondale, (adult standards) "Timeless Classics 1180"
1240 AM WJIM – (news/talk) "Lansing's Big Talker"
1320 AM WILS – (news/talk) "More Compelling Talk"
1580 AM WWSJ – (St. Johns, urban contemporary gospel) "Joy 1580"
The Lansing Capitals began play in the International Basketball League in 2006 but eventually disband for a few seasons. The team recently resumed playing in the newly formed Independent Basketball Association in 2011. Michigan State University, located in East Lansing, is the largest university in the Lansing area. MSU sponsors both men's and women's sports, usually competing as a member of the Big Ten Conference. The Spartans have won National Titles in Men's Basketball, Football, Men's Boxing, Men's Cross Country, Men's Gymnastics, Men's Ice Hockey, Men's Soccer, and Men's Wrestling. On November 27, 2011 MSU beat Northwestern in their Big Ten Football finale to secure the top Big Ten record at 7-1 in conference play, and qualified to play in the first ever Big Ten Football Championship Game which was held December 3, 2011 at Lucas Stadium in Indianapolis, Indiana against the Wisconsin Badgers. The Michigan Flyer provides bus service between Lansing and Detroit Metro Airport eight times daily, with stops in Jackson and Ann Arbor along the way. I-69 runs from Indianapolis north to Lansing and east to Flint and Port Huron, connecting to Canada. I-96 runs from Muskegon, past Grand Rapids and Lansing, to Detroit. I-496 loops through downtown Lansing, connecting with I-96 on either end. BL I-96 is a loop route running through Lansing. Capitol Loop a loop route off I-496 serving the state capitol and other downtown facilities. US 127 is a north–south highway passing between the city and neighboring East Lansing, continuing northerly toward Clare and Grayling and southerly toward Jackson, Michigan and into Ohio. Amtrak provides intercity passenger rail service at a stop in nearby East Lansing, on the Blue Water line from Chicago to Port Huron. Four freight railroads serve Lansing including Canadian National Railways, CSX Transportation, Norfolk Southern Railway, and Jackson & Lansing Railroad. Greyhound Lines provides inter-city bus service. CATA and Greyhound are both located in the CATA Transportation Center (CTC) in downtown Lansing. Several taxicab companies serve the area. In 2008 the Green Cab Company opened using Toyota Prius hybrid cars to provide "green" cabs to Lansing. Michigan Flyer provides daily shuttle service between Lansing, Jackson, & Ann Arbor, to and from the Detroit Metro Airport. Daily The Michigan Flyer has eight shuttles east bound headed towards the airport, and also eight shuttles west bound headed back towards Ann Arbor, Jackson, & East Lansing. The Michigan Flyer luxury motor coach service is based out of East Lansing. The 13-mile (21 km), non-motorized Lansing River Trail runs along the Grand River and the Red Cedar River, running as far east as Michigan State University, and passes Potter Park Zoo, the Capitol Loop, and several other destinations of interest, and as far west as Moores Park. Since the trail follows a river, most street crossings use platforms under existing street bridges to provide an uncommon amount of grade separation, to the benefit of both trail users and automobile traffic. Terry Brunk – ex-WWE/ECW/TNA/WCW professional wrestler known as "Sabu"
Ed Farhat – professional wrestler known as "The Sheik"
Joel Higgins - actor who graduated from Michigan State University. Lansing was a sister city of Kubyashi District in Saint Petersburg, Russia. The agreement began in 1992 and ended in practice when a change to the political structure of Saint Petersburg cancelled the district. The relations were officially severed by Lansing in 2013 as a protest of the laws against LGBT rights in Russia. ^1 The city also extends into Eaton County along its southwest side. There are also two small non-contiguous tracts located in Ingham County. These sections are not highlighted on the map displayed as they are part of a 425 Agreement, meaning they do not officially count towards Lansing's area. ^ "U.S. Census Bureau Delivers Michigan's 2010 Census Population Totals, Including First Look at Race and Hispanic Origin Data for Legislative Redistricting - 2010 Census - Newsroom - U.S. Census Bureau". Census.gov. http://www.census.gov/newsroom/releases/archives/2010_census/cb11-cn106.html. Retrieved 2012-10-24. ^ "Telephone Directory". Ingham County. 2009. http://www.ingham.org/telephonedirectory.htm. Retrieved 2009-09-30. ^ Justin L. Kestenbaum (1981) Out of a Wilderness, An Illustrated History of Greater Lansing, Woodland Hills, CA: Windsor Publications, p.10-11. ^ Samuel W. Durant (1880) History of Ingham and Eaton Counties, Michigan, Philadelphia: D.W. Ensign, p.72–73. ^ Birt Darling (1950) City in the Forest: The Story of Lansing, New York: Stratford House, p.19. ^ a b c "Lansing History". City of Lansing, Michigan. 2008. http://www.cityoflansingmi.com/pnd/historypres/historydetails.jsp. Retrieved 2008-10-29. ^ Clymer, Floyd. Treasury of Early American Automobiles, 1877–1925 (New York: Bonanza Books, 1950), p.25. ^ "Forestry Division – History". City of Lansing, Michigan. 2008. http://www.cityoflansingmi.com/parks/forestry/history.jsp. Retrieved 2008-10-29. ^ Blumer, Stephen P. (c. 1989). "U.S. Geological Survey Water-Supply Paper 2375, p. 335–344". U.S. Geological Survey. http://md.water.usgs.gov/publications/wsp-2375/mi/index.html. Retrieved 2007-03-31. ^ MacLean, James; Craig A. Whitford (2003). Lansing: City On The Grand, 1836–1939. Arcadia Publishing. pp. 111–112. ISBN 0-7385-3152-9. ^ Dewey, Caitlin. "10 Great Cities for Young Adults". Kiplinger.com. http://www.kiplinger.com/tools/slideshows/slideshow_pop.html?nm=2010greatcitiesyoungadults. Retrieved 2012-01-24. ^ a b c "NowData - NOAA Online Weather Data". National Oceanic and Atmospheric Administration. http://www.nws.noaa.gov/climate/xmacis.php?wfo=grr. Retrieved 2012-02-15. ^ "Monthly Averages for Lansing, MI". The Weather Channel. http://www.weather.com/outlook/health/fitness/wxclimatology/monthly/graph/USMI0477. Retrieved 2011-01-20. ^ "Climatological Information for Lansing, United States". Hong Kong Observatory. http://www.hko.gov.hk/wxinfo/climat/world/eng/n_america/us/lansing_e.htm. Retrieved 2011-01-20. ^ a b "Fresh, Local, Unique". Lansing City Market. http://www.lansingcitymarket.com. Retrieved 2012-10-24. ^ "Lansing (city), Michigan". State & County QuickFacts. U.S. Census Bureau. http://quickfacts.census.gov/qfd/states/26/2646000.html. Retrieved May 14, 2012. ^ "Michigan - Race and Hispanic Origin for Selected Cities and Other Places: Earliest Census to 1990". U.S. Census Bureau. http://www.census.gov/population/www/documentation/twps0076/twps0076.html. Retrieved May 14, 2012. ^ (September 2006) "From ‘There’ to ‘Here’: Refugee Resettlement in Metropolitan America". Metropolitan Policy Program: 11. Retrieved on 23 October 2013. ^ International Services Team (2011). "International Guide to Greater Lansing". American Red Cross. http://www.ryanmentor.org/international-guide. Retrieved 23 October 2013. ^ Campbell, Kyle (2 October 2011). "Seeking refuge". The State News. http://statenews.com/article/2011/09/seeking_refuge. Retrieved 24 October 2013. ^ Campbell, Kyle (17 November 2011). "Students help refugee center". The State News. http://statenews.com/index.php/article/2011/11/students_help_refugee_center. Retrieved 23 October 2013. ^ "Cool Cities – Stadium District". http://www.coolcities.com/project78.html. Retrieved 2009-10-11. ^ "Creating A District". http://www.thestadiumdistrict.com/district.htm. Retrieved 2009-10-11. ^ Wednesday, February 27, 2008 (2008-02-27). "Mutual Building Renovation Shines In Downtown Lansing". Capitalgainsmedia.com. http://www.capitalgainsmedia.com/inthenews/mutu0208.aspx. Retrieved 2012-10-24. ^ "Lansing High School". Michigan Historical Center; Department of History, Arts and Libraries. 2006-08-31. http://www.michigan.gov/hal/0,1607,7-160-15481_19271_19357-150502--,00.html. Retrieved 2008-10-29. ^ "Home". Glps.k12.mi.us. http://www.glps.k12.mi.us/. Retrieved 2012-10-24. ^ "Tape (2001)". IMDb.com. http://www.imdb.com/title/tt0275719/. Retrieved 2012-10-24. ^ Courtesy photo. "So, why exactly is 'Tooth Fairy' set in Lansing, Michigan? It is a mystery". MLive.com. http://www.mlive.com/entertainment/grand-rapids/index.ssf/2010/01/so_why_exactly_is_tooth_fairy.html. Retrieved 2012-10-24. ^ Pulse, City S. "Top of the Town Awards- City Pulse". Best Music. http://www.lansingcitypulse.com/lansing/article-2806-best-music.html. Retrieved 2010-04-08. ^ Pulse, City (2011-03-02). "Top of the town awards". Lansingcitypulse.com. http://www.lansingcitypulse.com/lansing/article-5550-top-of-the-town-awards.html. Retrieved 2012-10-24. ^ "AMS/Lansing 150 - TC Film Companion - MAIN". Ams891.wikispaces.com. http://ams891.wikispaces.com/TC+Film+Companion+-+MAIN. Retrieved June 4, 2013. ^ "Greater Lansing Woman | Lansing State Journal". lansingstatejournal.com. 2012-09-24. http://www.lansingstatejournal.com/apps/pbcs.dll/section?category=glw. Retrieved 2012-10-24. ^ Wednesday, September 10, 2008 (2008-09-10). "Southside Lansing Businessman Starts Green Taxi Cab Company". Capitalgainsmedia.com. http://www.capitalgainsmedia.com/devnews/cab0235.aspx. Retrieved 2012-10-24. ^ Brad Garmon (2008-12-17). "Top 10 of Green". Capitalgainsmedia.com. http://capitalgainsmedia.com/features/green0248.aspx. Retrieved 2012-10-24. ^ Recker, Rachel (2009-01-09). "Gran Torino actress Ahney Her returns to Michigan for opening night". The Grand Rapids Press. http://www.mlive.com/movies/index.ssf/2009/01/gran_torino_actress_ahney_her_1.html. Retrieved 2009-01-11. ^ "Sister Cities, Public Relations". Guadalajara municipal government. Archived from the original on March 2, 2012. http://web.archive.org/web/20120302011742/http://www.guadalajara.gob.mx/dependencias/relacionespublicas/versioningles/sistercities.html. Retrieved March 12, 2013. ^ Howell, Brandon (14 August 2013). "Lansing Regional Sister Cities Commission: There are no ties with St. Petersburg, Russia to sever". MLive. http://www.mlive.com/lansing-news/index.ssf/2013/08/lansing_regional_sister_cities.html#incart_river. Retrieved 14 August 2013. Wikivoyage has a travel guide for Lansing, Michigan. This page uses content from the English language Wikipedia. The original content was at Lansing, Michigan. The list of authors can be seen in the page history. As with this Familypedia wiki, the content of Wikipedia is available under the Creative Commons License.